Sudden cardiac arrest (SCA), a sudden and unexpected pulseless condition, strikes more than 1,000 people outside hospitals (including about 16 youths <18 years old) every day in the U.S.—and most victims die. The odds of survival improve greatly when someone recognizes the emergency, decides to help, calls 9-1-1, starts CPR, and uses a defibrillator to shock the heart back to a normal rhythm. So many more could survive if they were treated in time. SCA victims need to receive CPR and defibrillation within a few minutes of collapse to maximize the chances for neurologically intact survival. 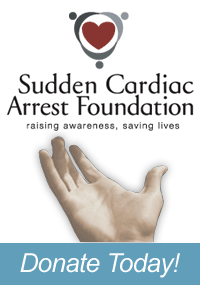 Yet only one-third of SCA victims receive bystander CPR and only 2% are treated with an automated external defibrillator (AED) by a bystander. When bystanders do intervene by providing CPR and using the nearest AED, survival rates increase from 8% to nearly 40%. SCA Foundation spokesperson Susan Koeppen, an award-winning TV journalist and a wife and mother of three young children, understands this first-hand. She was running with friends in preparation for a marathon when she collapsed in SCA. Fortunately, two medical students came upon the scene at exactly the right time and they gave her CPR until firefighter-EMTs arrived, continued CPR, and used their defibrillator to restore Susan’s pulse. Colleges are microcosms of the community at large. As such, they should be prepared to prevent death and disability from SCA among students, staff and visitors. This includes ensuring that students are trained in CPR and AED use and that AEDs are strategically placed on campus and with athletic teams. Is your college ready? Are you? Take action today. Read this booklet for ideas and inspiration. Go to www.sca-aware.org/campus for additional information and resources. Join the SCA Network at www.sca-aware.org. 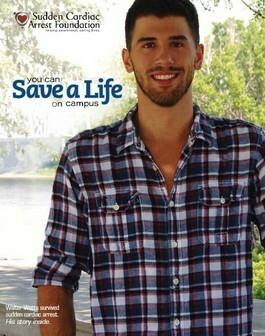 Like us at www.facebook.com/youcansavealife and follow us at www.twitter.com/youcansavealife. You can save a life. Get started now.